A Western woman’s story of 30 years in the Middle East – When Elisabeth Lindesay married a young international banker in 1950, she found herself uprooted from her comfortable Scottish home and swept into a new and colourful life in the Middle East. Married life became a whirlwind of house moves and homemaking, social engagements and childcare challenges as they raised their four offspring in a series of contrasting settings, all fascinating, but each with its own headaches, from eccentric nannies and peculiar foodstuffs to political riots. After moving from Iran to Jordan while their first child was still a tiny baby, the couple went on to set up home successively in Syria, Lebanon, Sudan, Tunisia, Libya, Qatar, Kuwait and Morocco, giving them a far greater insight into life in the Middle East than most Westerners could dream of. 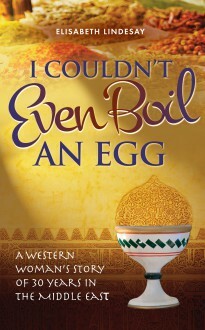 I Couldn’t Even Boil an Egg is Lis’s account of those happy, hectic years.